If you are a body shop, undertaking crash repairs that are billed to insurance companies, you may be waiting 60 days or more to get paid for the work that you undertake. You don't have to wait to get paid, you can sell those invoice for their full value (less a small charge for using the service) and get your money in 24 hours. You will not have any further responsibility after you sell the invoices, that passes to the company that buys your invoices. 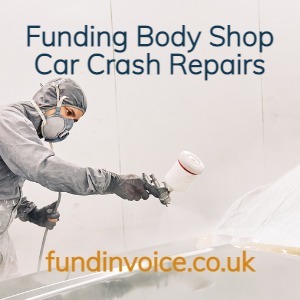 Funding invoices for body shops is a simple service that requires no company debentures and no personal guarantees. Bad debt protection is provided as standard so once you sell the invoice, it becomes the finance company's problem, if the customer fails, or takes extended credit - the charges don't increase. How Does Body Shop Invoice Finance Work? Your invoice to the insurer (granting them credit terms as normal). Authority from the insurance company. A satisfaction note, signed by the customer. You receive the value of the invoice (less the charge) the following day. The invoice financier takes on the task of recovering the money from the insurance company, once the invoice becomes due. You don't have to get involved again. The fee is typically c. 3% of the invoice value (we can get you a quote for your company - see below) - that's the total cost of selling your invoices. There are no other charges, no set up fees, no renewal fees, no discount charges or interest. That means that you get 97% of the invoice value and there are not futher charges to worry about - you have effectively sold the invoice for 97% of its face value. You get c. 97% of the invoice value within 24 hours - without the uncertainty of waiting to see when the insurer pays. The fees are a fixed amount e.g. c. 3% of invoice value - there are no other charges. Bad debt protection means if the customer doesn't pay, it's the finance company's problems, not yours. You can pay for your labour costs, and your suppliers for parts and supplies with the cash you receive. No having to shop around suppliers for parts, as you are up to your credit limits. You don't have to do the credit control - the funder does all of that. No debentures, charges over your assets or personal guarantees - you just undertake not to commit any kind of fraud. You can pick and choose which invoices, or customers, to fund. You can select the slower paying insurers if you wish. You can stop using the service at anytime, without any penalty charges.